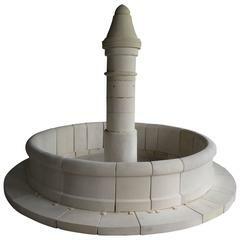 Italian wall fountain handcrafted in limestone from the 21st century. Ready for installation, top of the line quality art work. More info on demand. Ready for installation. Wall fountain standing on a baluster base, with an rectangular basin, a grooved wall and a tall, curved rear wall with volutes. The fountain is hand-carved out of Giallo d'Istria.